It’s been a while since I’ve written anything here. My grandfather passed away last month and that took a lot of my blogging energy away from me. I knew I wanted to dedicate a post to him as he was as much a foodie as I am, but my words escaped me. In my failed attempts to write, I would stare blankly at my computer screen as memories of him streamed through my thoughts. When I slept over my grandparent’s house as a kid, I would often hear my grandfather poke around in the kitchen, usually around dawn, well aware that my grandmother could sleep through anything. I, of course, would get up from bed to find him alone in the kitchen, happily stirring a hefty pot of homemade jam (his specialty) or preparing some sort of sweet treat without my grandmother there to convince him against it. When he noticed me watching he would let out big a smile, and allow me to stay and help so long as I didn’t wake up anyone else. Since I haven’t yet perfected my grandfather’s rose petal jam (مربة الورد), his claim to fame, I decided to make one of my favorite cookies I grew up eating called ma’moul (معمول). 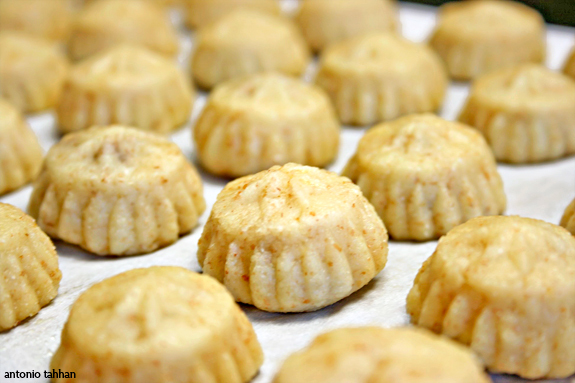 If you’re Arabic, these cookies need no introduction as they’re popular all around the Middle East, where they’re stuffed with either walnuts, pistachios, or pureed dates. The cookie itself tastes a lot like butter cookies, but these also have more of a crumbly, shortbread texture because of their semolina base. 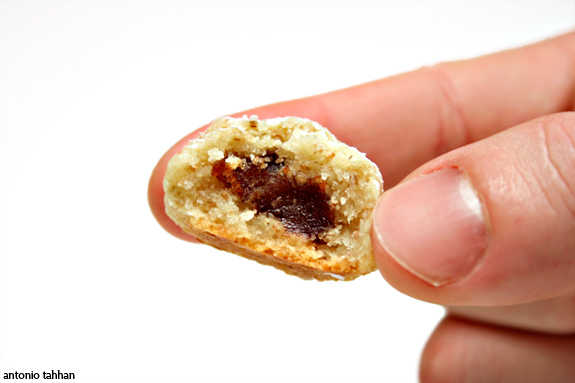 The secret ingredient that makes these cookies so special is called mahlab, which is an aromatic spice obtained by extracting the seed kernels from inside the cherry stone of the St. Lucie Cherry. It’s very popular in countries like Greece, Turkey and all around the Middle East. note: Since I won’t be able to host this month’s A Taste of the Mediterranean, I want to give away some mahlab to three randomly chosen commenters on this post (by May 1st). If you’d like to share, I’d love to know how family plays a roll in your cooking since it is something I have given a lot of thought to this month. Thank you for your support and understanding. 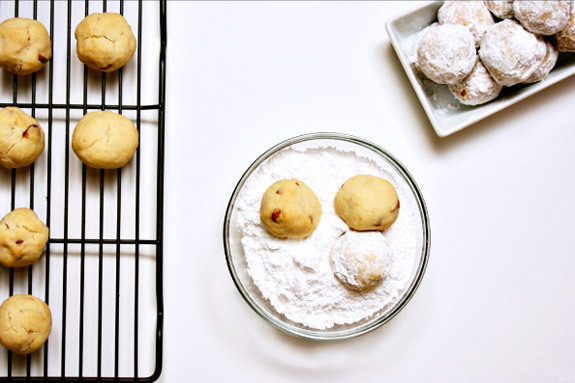 The mahlab gives these cookies a subtle nutty flavor that you won’t pick up on immediately, but you’ll certainly notice if it’s missing. Mahlab is also very popular in Turkey and Greece for flavoring egg-rich breads similar to challah in Jewish cuisine. As with most Middle Eastern dishes, these cookies take some patience. If you don’t have Middle Eastern cookie molds laying around, you could use any circular molds, or you could even free-hand them like Kate from Aaplemint did. Anyway you form them, they’ll look beautiful and taste amazing. Funnily enough, I wish I had a pair of pantyhose when I ventured to make these cookies. While visiting the Middle East last winter I learned that some women have a pair of clean pantyhose set aside that they use especially for removing these cookies from their mold. That way you don’t spray the mold with anti-stick spray or bruise your hand in the process, like I did. Mix 1 stick of the melted butter in with the farina and semolina and knead until well mixed. Cover and let sit over night. 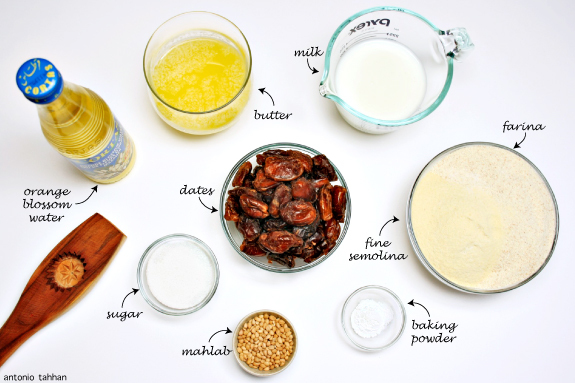 To make the filling process the pitted dates with the remaining tbsp of melted butter, 2 tsp of orange blossom water, and half of the ground mahlab in your food processor until it becomes a smooth paste. Once the butter has soaked into the semolina add the remaining of the ingredients, except the hot milk. Pour half cup of the hot milk and mix well to form a dough. The dough should be smooth and moist; if it feels a bit dry continue adding more milk. 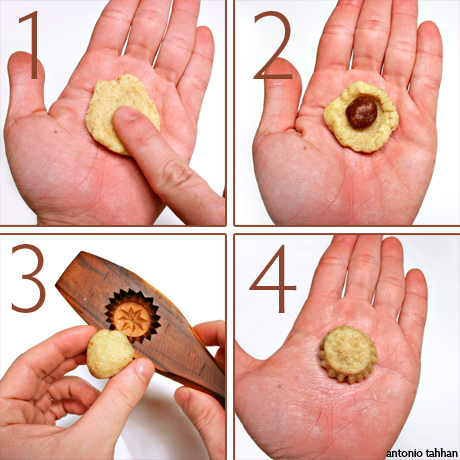 Form each cookie with a mold or freehand as shown in the photo above (by hiding a ball of the date filling inside the dough). Place on a parchment-lined baking sheet and bake in a 325 degree F oven for 25-30 minutes or until the bottom is golden brown. Cool the cookies on a cookie sheet and sprinkle with powdered sugar for garnish. notes: Cream of Wheat (aka Farina) should be available at all major supermarkets. For these cookies I use the red box that says 2 1/2 minutes. Thank you for all the Christmas wishes – I wish everyone happy eating and the very best for 2009! My Christmas food coma lasted slightly longer than I anticipated with all the leftovers we have had at my house. In all seriousness, my mom went into full-on Arabic mode and cooked enough food to feed a medium-sized Army; needless to say it was more than enough for the 20 guests we had at our house. I contributed a humble tray of baklava, which I’m posting about today. But, before I forget, I want to give props to Marianna who correctly named the famous Lebanese singer on my computer screen in my stuffed grape leaves post: Najwa Karam. I have some Middle Eastern goodies that I’ll be sending your way once I fly back home. The two Greek Pete’s must forgive me when I say this, but Middle Eastern baklava is the best I’ve had. It might be because I grew up hooked on the countless trays my grandmother would whip up in her kitchen for parties, birthdays or when she knew her grandson was visiting – I’m not sure. Don’t get me wrong though, I’m not one to turn down a good serving of the Greek kind either! My mom has had this scale for longer than I can remember. It’s seen better days, yes, but it never lets her down. Oh, and mise en place you ask? 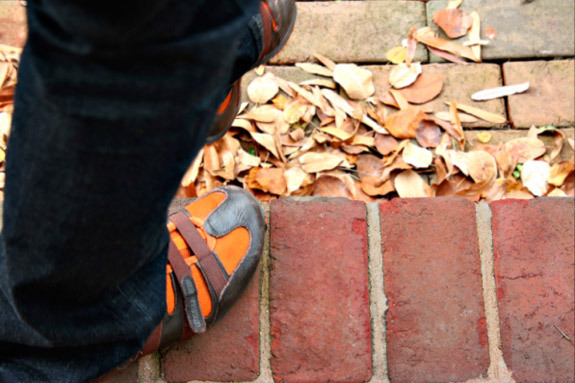 I was already pushing it with my camera and asking to take photos of every step. 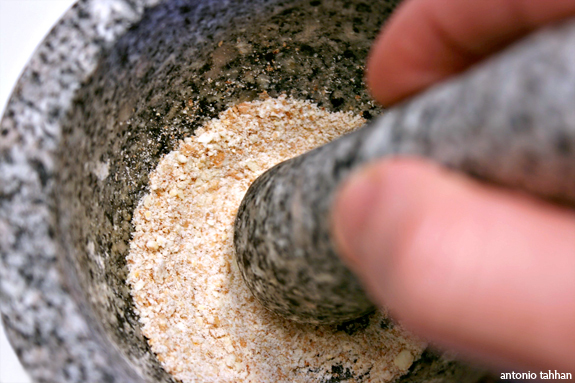 This is probably one of the most crucial steps for a good baklava, Greek or Middle Eastern. You want to use clarified butter to avoid the butter from burning in the oven and you also want to make sure to brush each layer liberally to achieve maximum crispiness. The walnuts must be fresh for making baklava. Taste the nuts before you use them and chuck them if they’re rancid or stale. You also want to make sure you use fresh ground cinnamon for the filling. These little components is what makes for a good baklava. 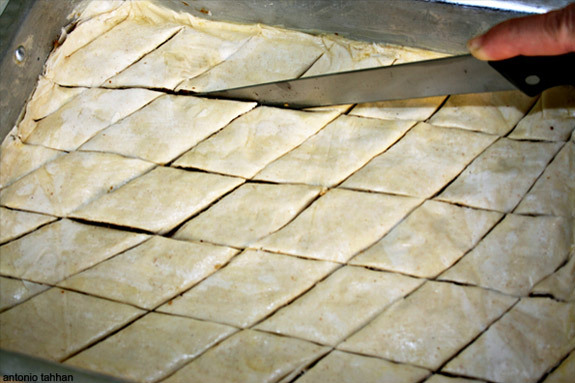 Since the layers will be too crispy when the the baklava comes out of the oven, you want to slice it before you bake it. This will also help the baklava absorb the syrup once it’s finished baking. This syrup, called عطر (a’ater) or شيرة (sheera), must be at room temperature and poured over the baklava as soon as it comes out of the oven. Alternatively, you can let your baklava come to room temperature and douse it with hot syrup, but I find the first way to be more convenient. QUESTION: I have a morning show appearance coming up and cannot choose between this baklava and this Middle Eastern almond drink I blogged about before. Which would you choose for a 3-minute demo? I’d love to hear what you think! 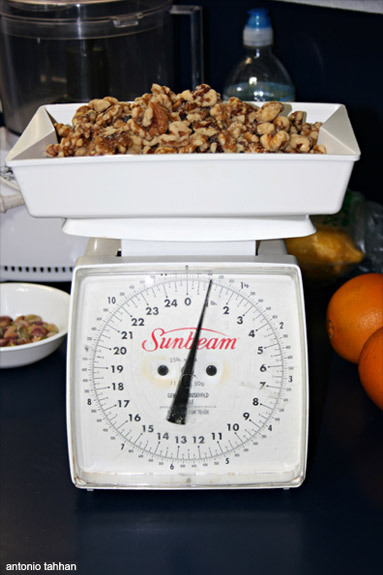 Pulse the nuts, cinnamon & sugar in a food processor until you reach a slightly coarse consistency. 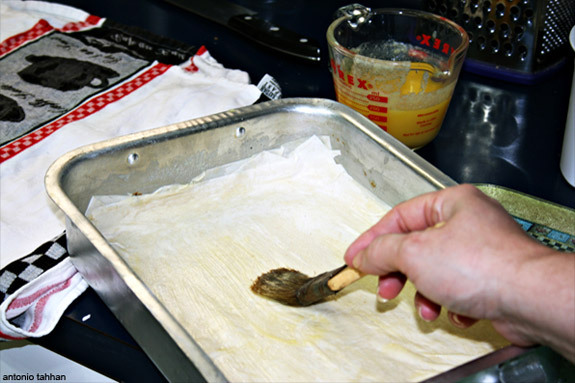 With a pastry brush begin by brushing the bottom of a 9X13 pan. Layer 8 sheets of phyllo dough, making sure to brush butter between each one. Spread half of the nut mixture. Layer 4 more sheets of phyllo dough. 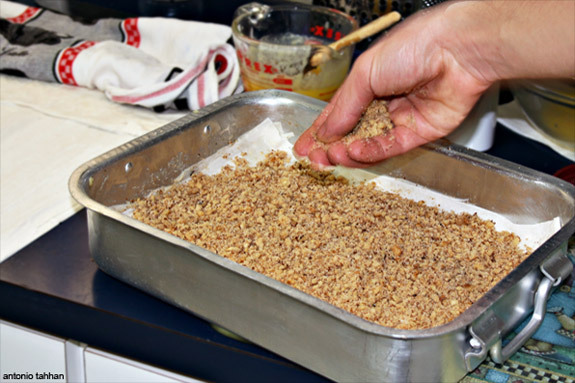 Spread the remaining half of the nut mixture. Top with the remaining 12 sheets of phyllo, making sure to brush the top layer with butter as well. 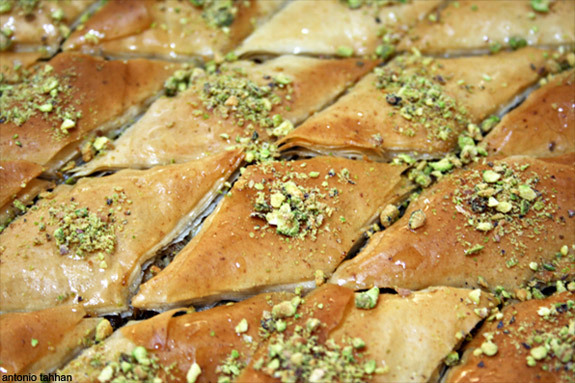 Slice the baklava into small diamonds (approx 24-32). Bake for at least 2 hours until slightly golden brown on top. 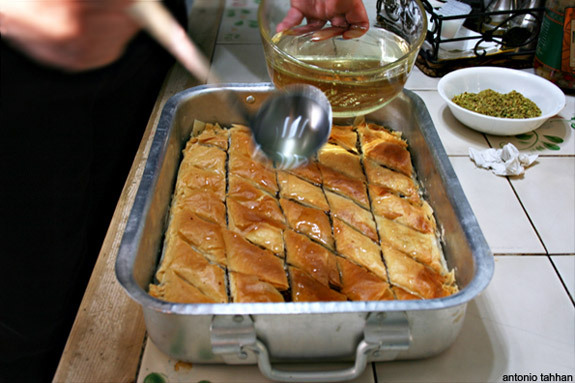 Pour cooled syrup over the baklava as soon as it comes out of the oven and allow to come to room temperature again before serving. Bring ingredients to a simmer over medium heat. Continue cooking over low heat until mixture becomes syrupy (approximately 10 minutes). note: Syrup can be made days in advance and stored in an airtight container. It’s time I made a dark confession. You see, when I started this blog, I promised you the whole Mediterranean – and I played favorites. I withheld from you the Aegean nations, the lands of Greece and Turkey. Two ancient countries with glorious cuisine, and I simply rubbed them right off the map! As you well know, I was reared in a kitchen that straddles Lebanon and Syria; I’ve discussed the details of turning humble chickpeas into delightful hummus. I’ve strolled the streets of Florence in search of traditional Tuscan biscotti; I’ve even blogged about the time-honored Moroccan art of preserving lemons. Yet I have not seen the Parthenon, nor have I savored the moussaka of an Athenian gourmet chef. Today, dear readers, we will travel together to Greece in spirit and in palate. For food, I decided to raid my Greek friend Peter’s blog, who most of you might already know as Kalofagas, the Greek gourmet. I promise to focus on my Turkish deficit later this week. One country at a time. I put on a light jacket and looked for my favorite black scarf buried deep within the box of winter clothes tucked away in the corner of my room. For now, here I was; figuratively stepping out of my comfort zone (i.e. my humble front porch), ready to document unchartered territory on this blog. I went for a walk to clear my thoughts and enjoy the crisp fall air snuggled within the sunny day. It was the perfect weather far basking in the remaining fall foliage. After my walk, it was difficult not to get excited for the upcoming holiday season. Call me a cliché, but there’s something mystical about this time of year that seamlessly brings everyone together. Now that I was officially craving something festive for my Greek adventure, I opened Peter’s site for some culinary inspiration. As I clicked through his blog, I realized I was bookmarking every other post. There were simply too many recipes I wanted to try. A simple ‘Christmas’ search narrowed my overwhelming operation to ten posts, three of which featured sweets. Of these three, it was the powdery white appearance of his Kourabiedes cookies that had me wishing Christmas was right around the corner. Peter calls for a shot of brandy in his recipe, but I had to make do without any. 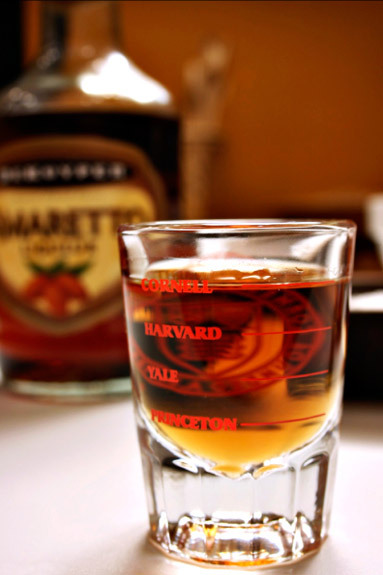 I did, however, fill up my favorite shot glass with amaretto and prepare the rest of the ingredients. The ingredients for the cookies are basic, but they’re classic and well-loved. One of my favorite characteristics of any holiday cookie is the unadulterated buttery undertone that comes through in every bite. This flavor can only be achieved by using clarified butter, essentially butter with all its milk solids removed. This process couldn’t be easier and is one that shouldn’t be skipped. By removing the milk solids from your butter fat, you raise the temperature at which the butter begins to burn and end up with the desired clean, buttery flavor. Once you’ve creamed together the butter and sugar, the dough comes together almost effortlessly. 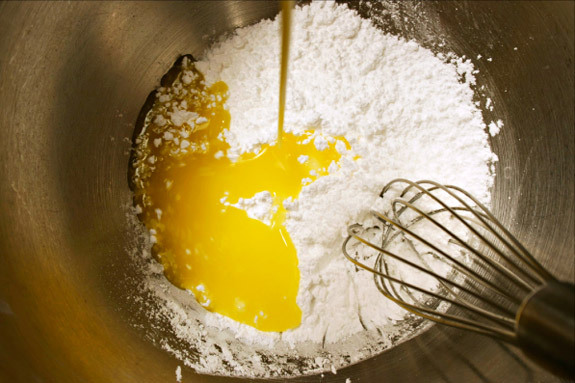 Mix in the egg, amaretto, vanilla, baking powder, vegetable oil, salt and slowly start incorporating the flour so as to not overwork the gluten. Once your dough comes together, gently fold in the chopped, roasted almonds to make it a done deal. At this point, if you haven’t already done so, break off a morsel of your beautiful dough and tell me you wouldn’t be happy eating the entire batch straight from the mixing bowl? I would, but then I wouldn’t have any Greek cookies to share with you and I’d be back to square one. So I resist the urge to eat the dough and proceed to preheat my oven. Peter shows off his Greek skills by forming the dough into traditional crescent shapes – I can’t be trusted with the dough any longer than I absolutely need to, so I opt for simple spherical shapes instead. The cookies eventually make it safely into the oven, with minor collateral damage, and bake while I prepare them their sugar bath. After a 20 minute tanning session, these cookies are ready to rest for a bit and roll around in a bowl of powdered sugar. Greek cookies definitely know how to live the good life. Peter even says that these cookies will last for up to three months in an airtight container. Then again, I doubt these cookies will last nearly for that long, but that’s good to know. 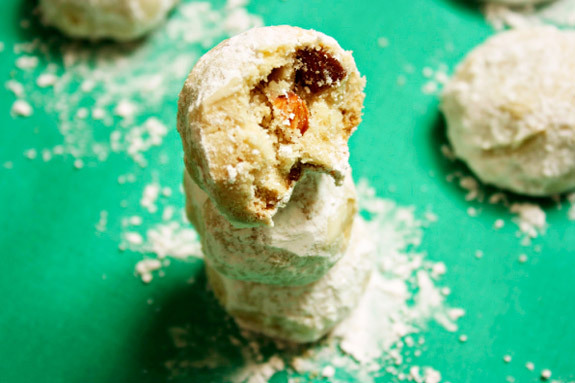 These cookies literally crumble and melt in your mouth; the perfect treat for the upcoming holiday season and any spontaneous, mythical trip to Greece. This cookie is for you, Peter! Clarify butter by melting it over low heat, carefully skimming off the milk solids that form at the surface and pouring out the butter fat that remains (also discard any white watery liquid that settles at the bottom). Allow butter to cool. Cream the butter and the sugar until pale and fluffy. Mix in vegetable oil, egg yolk, amaretto and vanilla extract. 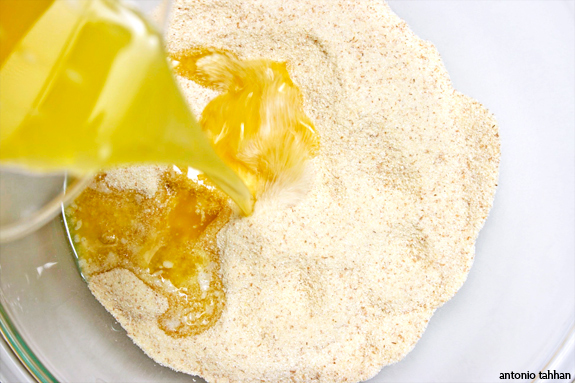 Slowly incorporate the flour and gently knead until a dough is formed. 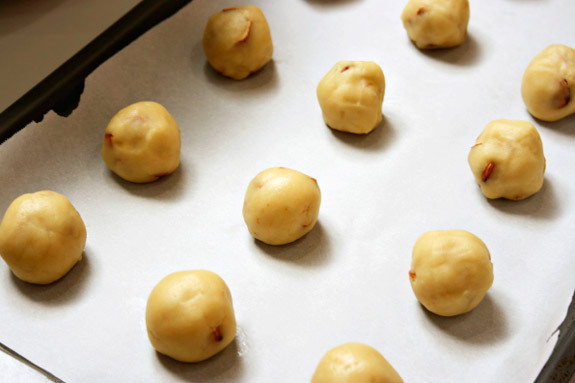 Fold in the chopped almonds and form cookies into walnut-sized balls. Bake in a 350 degree oven for 20 minutes or until golden brown. 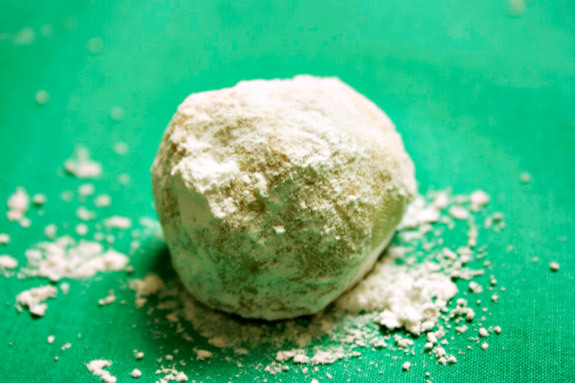 Allow cookies to cool, roll them in powdered sugar and store in an airtight container. note: Cookies will last up to three months in an airtight container stored in a cool dark place. Recipe slightly adapted from Peter Minakis. I would like to dedicate this post to all my family in Aleppo, Syria, and extend my thanks to everyone, especially my Aunt Christine for her kind hospitality during my visit to Aleppo. With each sip of this drink I remember them in my memories, which will last forever. My blog turned one this past Tuesday. I didn’t even think I’d last this long, but sure enough, I love to eat and a few snaps from the camera never hurt anyone (except when someone, ahem ahem, tries to eat the food before it’s been thoroughly photographed). All is well now; I’ve gotten a lot better at quickly taking the shots I need and clearing the food for consumption. Today I want to share a recipe that has been sitting in my back burner for a whopping 9 months now. 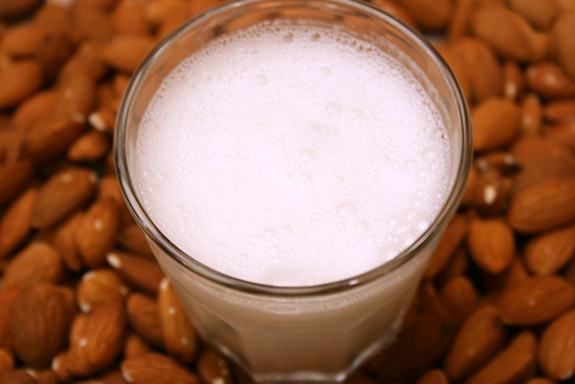 It’s for a traditional Middle Eastern drink called شراب اللوز (“sharab al loz” in English) that is made from just almonds, milk and sugar. I had it for the first time when I visited Aleppo last winter and there is no better way to put it other than, I was hooked. Nothing complicated, but in my opinion, it was the essence of unadulterated almond perfection. Don’t think it was easy though, I worked for this recipe, very, very hard. As soon as I showed even the slightest interest in knowing how this drink was made, it was as though the whole country simultaneously suffered varying degrees of memory loss. No one was ready to divulge their secrets, but I wasn’t about to give up just yet. I had no shame; I employed the help of my cousins and we went store to store asking around for the recipe. After a while we lost track of whom we had already asked and ended up asking some people multiple times – they weren’t too happy about this. Eventually we found a kind old man who sold buttons and fabrics, and with my broken Arabic I initiated a conversation with him. I think he felt sorry for me more than anything else and gave me a very basic idea of how the drink is made. I, of course, thanked him for all his help and my cousins were simply relieved they weren’t on recipe duty anymore. As soon as I got back to school, this was one of the stories I shared with the dean from Cornell that funded my dream research project. She thought it was odd that I had such a fascination with something that already existed in the States and was readily available at all major supermarkets. She prefaced the comment with her opinion that the almond milk found in the organic section of the grocery store doesn’t taste well, but being the curious foodie that I am, I gave it a try. Not only was she right, but “doesn’t taste well” was a complete and utter understatement. The almond milk I had from the store tasted like someone had soaked cardboard in water for months, processed it and finished it off with a couple drops of the foulest-tasting almond extract known to man. My description may also be an understatement, but I hope it gets the message across. 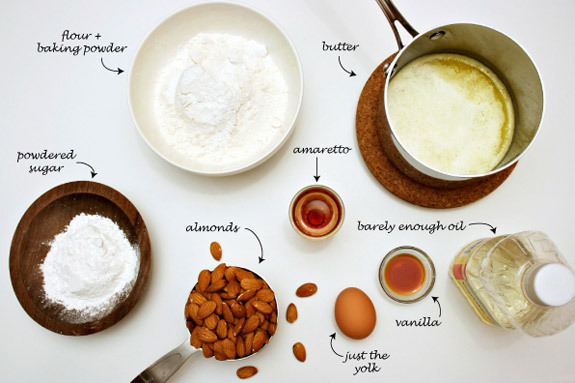 You can safely put away the cardboard for this recipe; we’re using nothing but real almonds here. 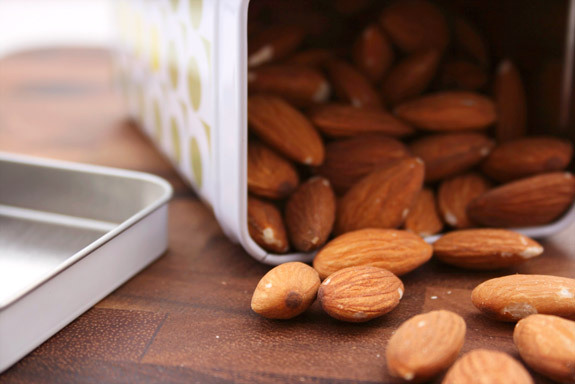 Besides being ridiculously good for you, almonds also have the added benefits of being delicious. These are the best sorts of foods in my opinion – guiltless and tasty. After soaking and blanching the almonds, the peels slip right off. I actually found it therapeutic, which is why I decided to add this picture. Does anyone else find other cooking processes therapeutic or is it just me? Anyway, I digress. Once you get the peels off, process everything in the blender until you get a smooth consistency (depending on the power of your blender, this may take 5-10 minutes). Once the mixture comes out of the blender it will be slightly thick as this is technically the base for the beverage. Keep this base in the fridge and whenever you want a glass of this frothy, almond drink all you have to do is blend it with some ice, a little more milk and saha w hana (bon appétit in Arabic). 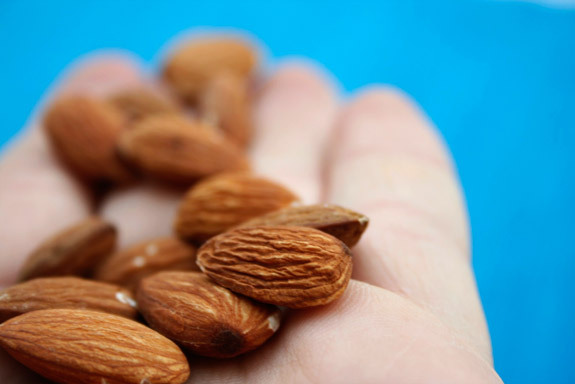 Soak the almonds in water overnight. 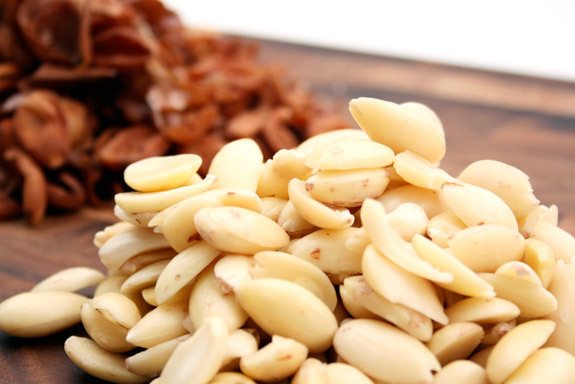 Boil the almonds for 10-15 minutes and peel immediately. While the almonds are boiling, make a simple syrup by mixing the sugar and water in a saucepan and simmering until all the sugar is melted. 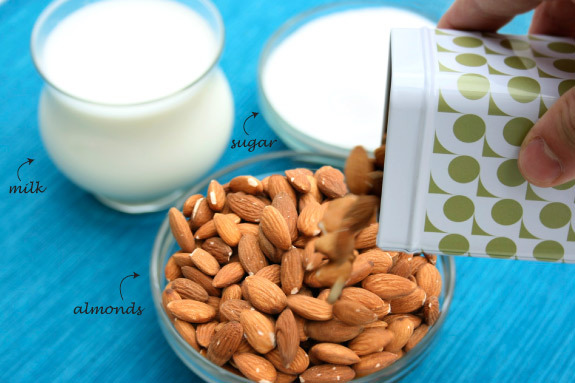 Blend the peeled almonds with the hot simple syrup. Warning: be sure to vent your lid and pulse so that the hot syrup does not explode when you turn on the blender. 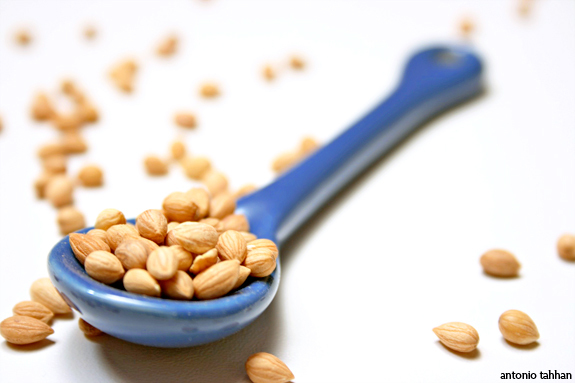 Blend the almond mixture for 7-10 minutes in a strong blender. Strain the mix with a cheese cloth or a fine sieve and refrigerate until ready to serve. Once the sharab (the base) is cooled, you can prepare the beverage by mixing 1 part sharab, to 1 part milk and a little ice. You can add more milk and ice to thin out the consistency to your liking. notes: If you’re lactose intolerant you can try replacing the milk for some soy milk. Also, if you want to reduce the amount of sugar, honey is a great alternative.